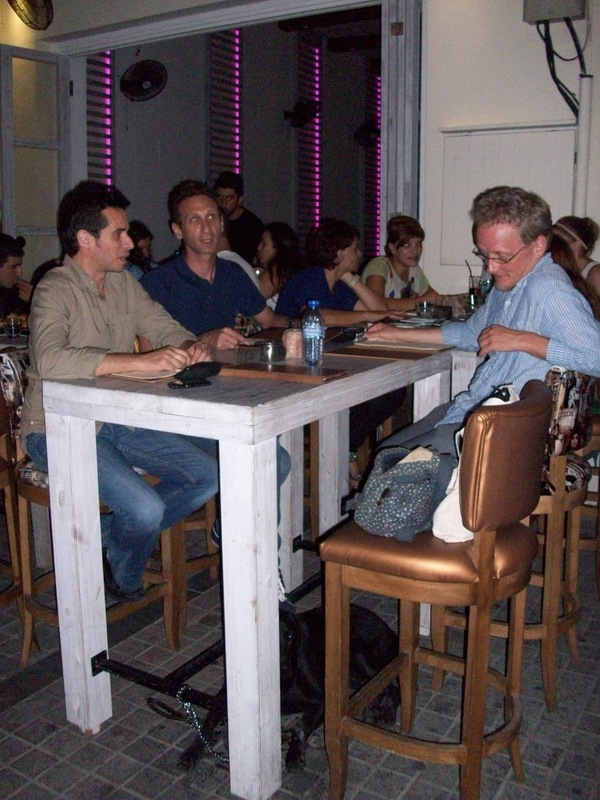 Yesterday we took Sage for an evening out in Lemesos. I'll say now, I don't know the city very well. Lately I've been thinking about how much harder it is to move around a city that you don't know with your dog. It's one of the main reasons for writing this blog in the first place. This is an obvious thing to say, it's just that after a few months living in Larnaca, I've come to understand where we can go for Sage to have a run around, where we can go for a drink so that she will still be comfortable, where/when it's better to leave her behind etc. And in Lemesos yesterday, I didn't have a clue. 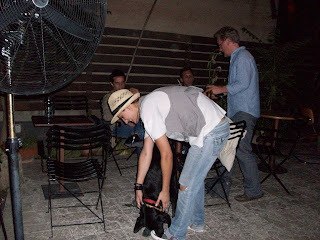 https://www.facebook.com/pages/Kanella-Grill-Bar/133955253447870 Here they were fine about Sage sitting outside at the table with us. It was ok there in the early evening, about 9ish, but when we walked through around midnight (on an ordinary Tuesday) it was extremely noisy and crowded - everyone would have been stepping on her and she would have been quite overwhelmed. 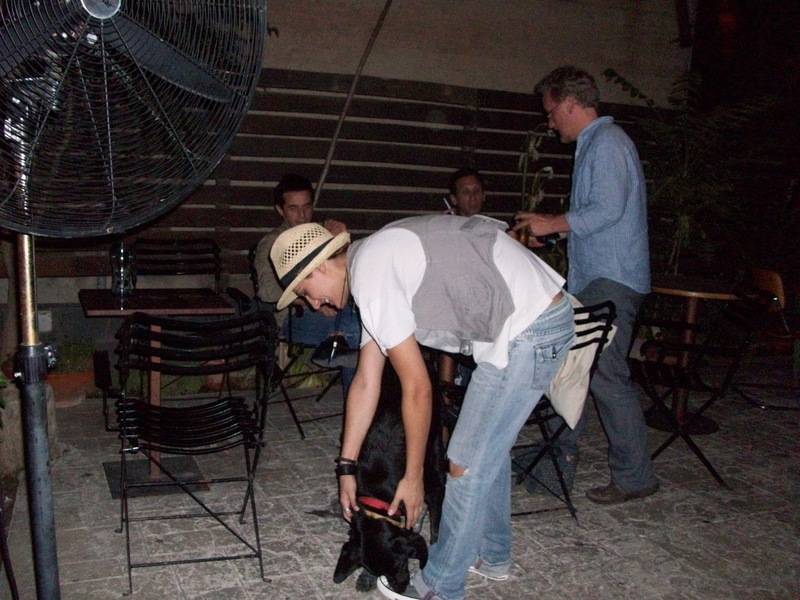 The chairs and tables are very high, so it's not very sociable for the dog to be sat down below your feet. I don't really recommend this place with your dog, although they were accepting enough. Our guide (a friend from Lemesos) told us this place gets pretty crowded at the weekend, and becomes more of a club than a bar. Mid-week, however, it was lovely. We sat outside in their garden, which was full of plants and trees (a big pomegranate tree in the middle, lilies around the outside), nice lighting, interesting mix of music. It was quite a young crowd, I would say mostly the 20-35 age range, but not exclusively. The staff were really sweet and friendly to Sage, then on the way out we had to stop at every table so the other customers could pet her. 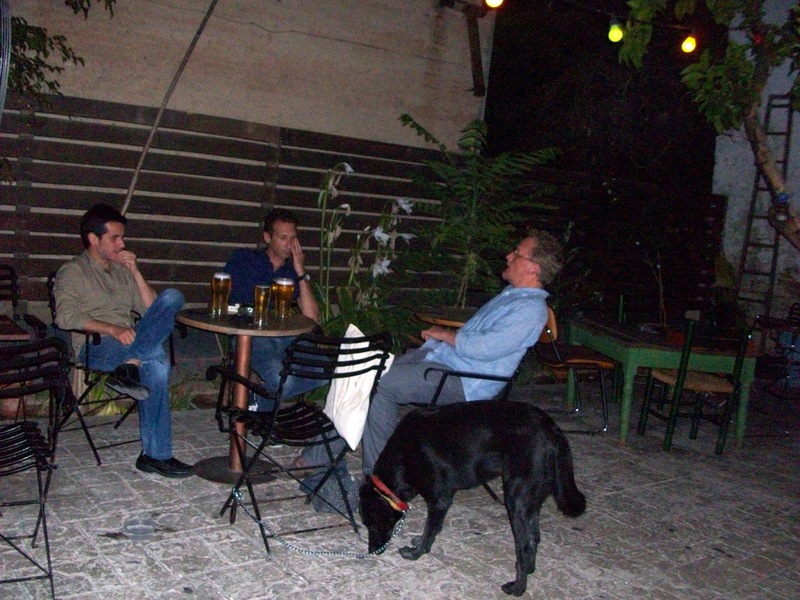 I really liked this place as a calm escape from the crowds of Lemesos, and even more so for being very dog-friendly. Update: On a recent trip to meet a friend who lives in Lemesos, we went searching for somewhere we could sit and have a bite to eat, together with Sage. This was a busy Sunday lunchtime before Christmas. It was difficult weaving through the crowds of shoppers with their bags and children. 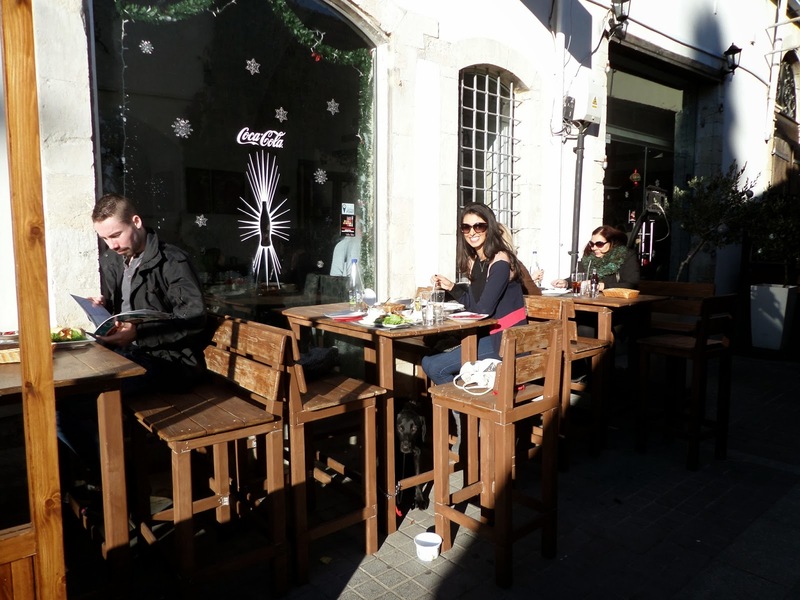 We were politely refused entrance at several cafes and tavernas, even to sit outside at the pavement tables. I was starting to feel like I was walking through town with a fire-breathing dragon or something, not a dog! 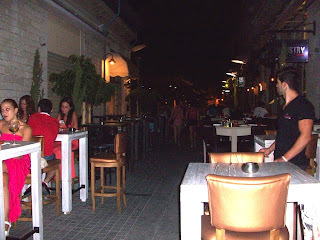 Finally, we found our way to the cafe-bar called Ousia (essence) (www.ousia-lounge.com). 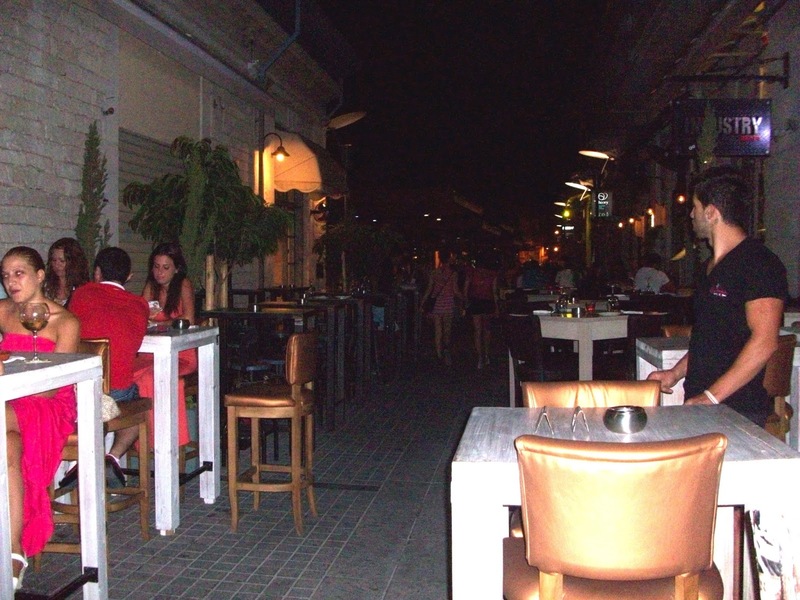 This bar is on Palaio Kastro Square, and has tables set out along the narrow street outside. The staff at Ousia were great, very welcoming and friendly to us and to Sage. I was a bit underwhelmed by the food (I chose falafel in pitta which were nothing special) but they are going more for a bar with snack food, rather than a restaurant. Prices were reasonable for the centre of town. 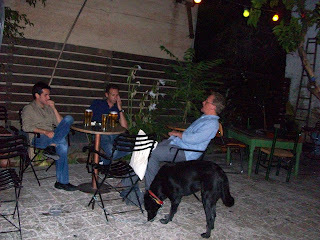 One negative about Ousia was the feral cats that were lurking below the high tables of the bar. One in particular was totally fearless and kept dancing by Sage looking for handouts. They had a noisy scrap, Sage came off worse, and we left in a bit of a hurry. I'm going to continue my search for dog-friendly bars, restaurants, parks etc. in Lemesos, but please write any experiences or suggestions you might have in the comments box below - and I'll go and explore as soon as I can.